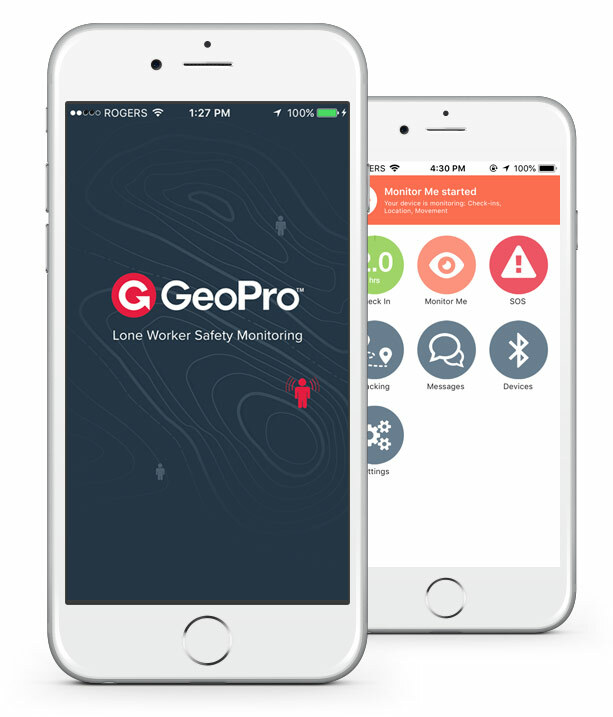 A handy quick reference chart comparing key features of the most popular lone worker safety devices, and compatible safety monitoring applications, designed to protect lone workers at remote or greenfield job sites where cellular coverage is unavailable. 6.5 x 2.7 x 1.5" 6.5 x 2.7 x 1.5" 5.87 x 2.4 x 1.20" 5.87 x 2.4 x 1.20" 5.5 x 2.4 x 1.1"
If you’re looking for a mobile app with check-in and emergency alerting features to help protect lone workers at job sites where there’s reliable access to cellular coverage, consider the GeoPro Lone Worker Mobile App. The mobile app also supports the use of a wearable for unobtrusive checkin and emergency alerting.